It's hard today to be surprised in the cinema. It's probably because we've already seen most of a film's plot, condensed into a two minute trailer and thrust before us months before we take our seats in the theater. But if you're stuck waiting for the third act to kick in and some semblance of denouement, there's sanctuary to be found in the humble poster. A title, a director, an image; perhaps a quote. That's it. Of course some are bad, and many are either rip-offs or riddled with cliches. However, if it's good, a poster can render a trailer superfluous while enticing us in by posing a myriad of questions. Take "Mademoiselle" ("The Handmaiden"), the latest offering from South Korean director Park Chan-wook. The man who brought us "Oldboy" and "Stoker" is at Cannes touting his adaptation of Sarah Water's novel "Fingersmith", set in 1930s colonial Korea and Japan. We're promised class friction, deception and a thick-as-molasses plot from the literature supplied by the film's distributors, but it's all there in the poster. Among Japanese maples, a woman -- we assume the titular handmaiden -- holds a parasol over her mistress; two naked lovers embrace. A man gazes at the ground worrisomely whilst an elderly man reading a book is carried on the back of a porter. And, beneath a maple bow, a young woman hanging by the neck. So many questions conjured by a single, beautifully stylized poster. (Even more questions are raised by comparing it to the revisions made for the Korean edition.) It sets the tone quite fabulously -- a gritty thriller this film is clearly not. 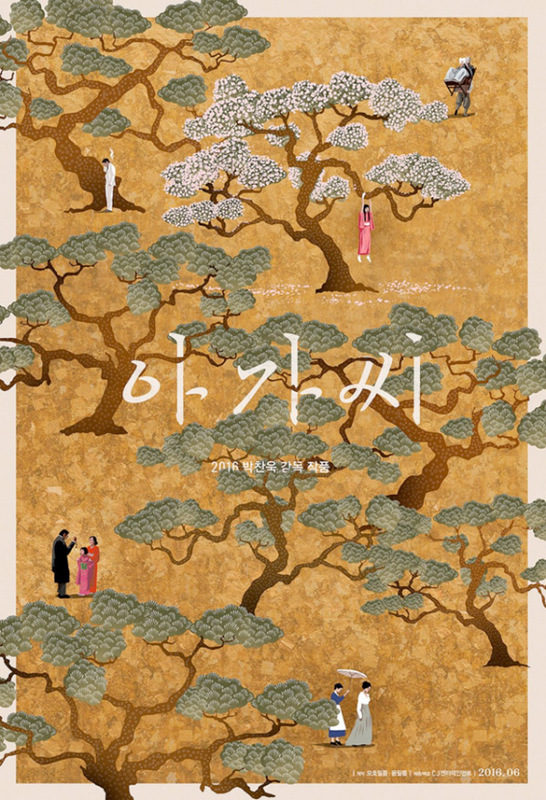 At the other end of the spectrum is "Goksung" ("The Wailing"), also flying the flag for the East Asian graphic design community with its sumptuous range of teaser posters -- although the original language versions are sadly not on display at Cannes. Taught and anxious, melancholy permeates these unsettled characters, clearly agitated above the waters of a becalmed lake. Meanwhile, Nicolas Winging Refn's fashion psychodrama "The Neon Demon" pops with a Klimt-like sparkle that extends to its star, a guarded Elle Fanning. The subtext is clear: the model's body is every bit as consumable as the high-end clothes she wears. They, among others, demonstrate the evocative power of the image, teasing the film with a subtlety betrayed by the more overt trailer. For the purist, the poster remains both a preserve of mystique and an antidote to the avalanche of promotion we must wade through before making it to the cinema. Scroll through the gallery above for our selection the best posters from this year's Cannes Film Festival.